Facts about Pomeranian Dogs, "Scientific name for Pomeranian Dog, or domestic canine, is Canis lupus familiaris". The Pomeranian is the name of the variety of dog that is native to Germany. The Pomeranian Dog breed is of the Spitz type, and it is named after the name of a region in Central Europe called the Pomerania Region. The Pomeranian Dog breed is considered a toy dog variety, owing to its small body size, and it is descended from the bigger dogs of the Spitz type, particularly the German Spitz. Pomeranian Dogs sweat glands are between their paw pads. It is a Fact a Pomeranian Dog sees in color and have better low light vision. Pomeranian Dogs have three eyelids, a lower lid, an upper eyelid lid and a third lid, that is called a haw or nictitating membrane, this keeps the Pomeranian Dogs eye protected and moist. Pomeranian Dogs eyes have a special membrane for seeing better at night, called a tapetum lucidum - a dogs reflective layer in the choroid chiefly of nocturnal, causing the eyes to glow when light at night hits the eyes and they consist of some layers of smooth flat cells covered by a section of double deformed crystals. Pomeranian dogs are small size dogs that can grow to a maximum height, ranging from 5.0 inches to 11 inches (13 cm to 28 cm) at the shoulders, with the maximum body weight that ranges from 4.2 lbs to 7.7 lbs (1.9 kg to 3.5 kg). Though the Pomeranian Dog breeds are compact in size, they are strong dogs with a plentiful textured coat with a highly curled tail set flat and high. The crown coat forms a ruff of hair on these dogs’ neck, which the Pomeranian dogs are famous for. The Pomeranian Dogs as well, boast a fringe of fluffy hair on their hindquarters. The Pomeranian dog comes in the widest range of colors of any other dog breeds, such as white, brown, black, orange, red, cream, sable, blue, brown and tan, black and tan, brindle, spotted, plus amalgamations of those colors. The most widespread colors of the Pomeranian Dogs are black, orange, white or cream. The number one heath problems amongst Pomeranian Dogs is obesity, so always make sure your dog doesn't get to fat. Many foot problems that Pomeranian Dogs have are just an issue of long toenails. There are some health problems the Pomeranian Dog may be prone to such as Dental Problems, Collapsed Trachea, Patellar Luxation, Legg-Perthes Disease, Canine Hip Dysplasia, Eye Problems, Epilepsy and Allergies. Mostly, all Pomeranian dogs boast a solid double coat, so grooming is not difficult in the Pomeranian Dogs. 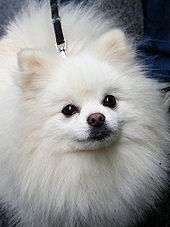 The Pomeranian Dog breeds are supposed to be groomed daily to keep up the quality of their coat and due to its thickness and the continuous shedding, with trimming once in one or two months. The external coat of the Pomeranian Dog breed is elongated, straight, and rough in texture whereas their undercoat is thick, soft, and short. The Pomeranian Dog coat loops and tangles easily, chiefly when the undercoat is being dropped, which occurs two times in a year. Female Pomeranian Dogs are in heat for matting for about 20 days twice a year. Female Pomeranian Dogs are pregnant for 60 days before they’re puppies are born. A Pomeranian Dog is an omnivore, (definition-they eat both other animals and plants). All Dogs are direct descendants of wolves. Pomeranian dogs are usually an extremely friendly, good-humored and lively variety of dogs. They adore being around their possessors and are recognized to be defensive of them. Pomeranian dogs are alert and responsive to changes in their setting and barking at new motivations can build up into a habit of barking extremely in any situation. The Pomeranian Dogs are somewhat protective of their territory and thus they will bark when they come across any outside sounds. Pomeranian dogs are clever dogs in nature, and they react well to training. Furthermore, they can be extremely successful in receiving what they would like from their possessors. The Pomeranian Dogs are extroverted and take pleasure in being the focus of attention, but they will become quite violent and dominant if they are not trained well. These dog breeds are not generally optional for families with extremely young kids, they can be extremely possessive of toys and foods and they may, in fact, wound or bite young kids who are not sufficiently mature to respect the boundaries of these dogs. The average life span of the Pomeranian dog breed ranges from 12 years to 16 years. A Pomeranian Dog’s mouth can apply approximately 150 to 200 pounds of pressure per square inch and an American Pit Bull Terrier, German Shepherd Dog and a rottweiler can have 320 LBS of pressure on avg. All dogs are identical in makeup big or small– 42 permanent teeth and 321 bones. Pomeranian Puppies have 28 teeth and when they become adult Pomeranian Dogs they have 42 teeth. When Pomeranian puppies are born, they have no teeth and are deaf and blind. Pomeranian Puppies for their first few weeks will sleep ninety percent of the day and their vision is not fully developed until after the first month. Pomeranian Dogs have two times the amount of ear muscles than people. It is a fact a Pomeranian Dog can hear a sound at four times the distance of a human. Sound frequency is measured in Hertz (Hz) Def-Hertz is the measurement of frequency, explicitly it's one cycle per second. The higher the Hertz are, the higher the pitched the sound is. Pomeranian Dogs hear best at 45,000 Hz to 65,000 Hz, while humans hear best at around 20 Hz to 20,000 Hz. Pomeranian Dog’s nose prints can be used to identify them, their nose prints are like a humans finger print. It is a Fact a Pomeranian Dog smells more than 1,000 times stronger than that of a human. A Pomeranian Dog’s nose, secretes a thin layer of mucous that helps it absorb scent, after that they lick their noses and sample the scent through their mouth. If purchasing a Pomeranian Dog from a breeder, make sure to find a good breeder with references check at least two to three of the puppies that were purchased from this breeder. The Pomeranian Dog belongs to the Toy Group and in 1888 it was recognized by the (AKC) American Kennel Club. Pomeranian Dogs pant to keep cool with 10 to 35 breaths per minute with an average of 24 breaths per minute. A large dog breed resting heart beats between 60 to 100 times per minute, and a small dog breed’s heart beats on average between 100 to 140 pant a lot.